With Christmas on the way, I thought now was the perfect time to talk about music in horror. However, I’ve been told it’s much more apt to talk about music in horror because Halloween is slowly approaching us. Go figure. Music as we’ve discussed over the past few weeks is one of the aspects of game design that is often either forgotten and poorly considered, or the icing on the cake. However with horror, we’ve got a much more important element to go with the music: The core of the game itself. Take for instance the curious example of Don’t Starve. Don’t forget that right now, Don’t Starve has opened a beta to players for the multiplayer experience, double up your survival horror adventures with your friends. In the case of Don’t Starve, we have this open, expansive world that you affect heavily. You can burn down a tree which in turn burns down a whole forest. This can make spiders flee from their homes in terror of the fire. You can build huts and wicked science machines, along with flesh effigies and face off against your own insanity. Why then would you choose music like the above? It’s simple: It suits the characters and the theme of the game. What I really appreciate about the music of Don’t Starve is how well it goes with the sound effects and character voices. In terms of the characters, their voices are usually noises from instruments, such as a trumpet or a flute. As such at the very heart of this game, music isn’t something that’s meant to make you twitchy from all of the jump scares, but rather it’s supposed to compliment the sound effects and the overall feeling of the game. It manages this with a simple, yet clever blend of cartoon-esque animations and the sound effects provided. When you have music that gives off an eerie vibe, along with visuals to back it up, the music becomes part of the core of the game itself. When you play a game that’s entirely about atmosphere, the music is perhaps the single-handed most crucial aspect of the game. So, with this in mind, what about an action-packed horror such as, let’s say, Killing Floor? Killing Floor is all action-packed as it’s a co-op survival horror game. Yeah, you might be seeing a theme of “survival” being a key part of the games I’m sharing right now. There’ll be other kinds of horror games later on. The Killing Floor OST (Original Sound Track) is quite different to games like Don’t Starve and the later games. The most important element of Killing Floor is it’s aggressiveness, which needs a soundtrack to join it that rivals it’s viciously violent nature. With guns galore and zombies everywhere, this is a game that forces you to think fast and consider your surroundings. However, to add to the frenzied feeling, you need something disorientating to keep you on your toes. So how about some generic sounding metal genre music along with the occasional noise of a zombie? That’s as disorientating as you can get. It doesn’t let you feel relaxed and to make it better, when you get to the big boss himself, the Patriarch, the music changes to a more intense feeling. It becomes more drawn out and you feel that the end is here. The music in Killing Floor isn’t as vital as the music in Don’t Starve. However, it serves to show that there are so many kinds of games out there that have music which really steer the game. Be it to add atmosphere, or be it to help disorientate the player within a horror situation, music in horror games is perhaps the most vital piece of the puzzle. It doesn’t help a user to play the game, but instead it helps the user feel immersed in the world which is key to horror. Next up then is… Pokemon? No, this isn’t strictly a horror game, but it incorporates some elements of horror to immerse players and help them feel all kinds of emotions. Of course most people would pick the infamous Lavender Town theme, but trust me my dear children: It’s far too early to be dealing with THAT particular song. In this theme, the constant strikes of the bell is what grabs the players attention. The sound of a bell being struck is synonymous with churches, graveyards and other such places. Commonly associated with death, the bell in this theme adds another layer to an already complex game. 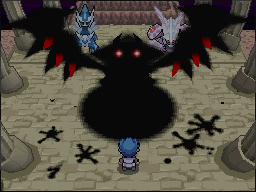 Whilst the rest of the game (and indeed the whole series) is lovely and jolly, there are moments where The Pokemon Company want to deliver a disruptively disturbing element to their games: The fight against Giratina is one of these. Part of the Creation Trio of the Sinnoh region, Giratina is a ghost/dragon type. A deadly combination to begin with, but playing firmly on the aspect of horror, for the Pokemon’s violent nature was what caused him to be banished to Distortion World. Now that we’ve had a look through some horror games and indeed a game that incorporates horror, I’d like you to let me know in the comments below what your favourite horror game music pieces are. Indeed, why not just tell us what your favourite horror game is for music? Is there a particular reason that is your favourite? Do you think simplicity or complexity of the key in your favourite horror games music? Next week, me and Joel are going to start a new path with this Blogversation series. It’ll become less of a back and forth conversation and more of a dissection of a topic that interests us. We’ve yet to come up with a proper name for this new series path, but don’t fret readers: Blogversation isn’t over with. This entry was posted on October 11, 2014 by Timlah. It was filed under Gaming posts, GeekOut discussion and was tagged with Blogversation, Discussion, Distortion World, Don't Starve, Games, Gaming, Geek, GeekOut, Giratina, Killing Floor, Music, Patriarch, Pokemon, Pokemon Platinum, Video Games.